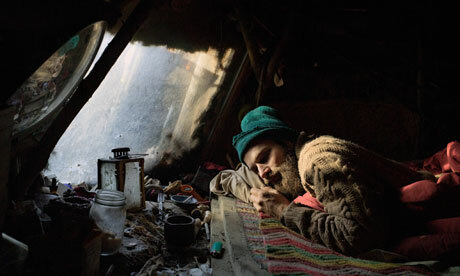 Lucas Foglia, who is 29 and looks 19, grew up on a farm on Long Island just 30 miles from Manhattan. His parents were part of the post 1960s "back-to-the land" movement, fired up on the writing of self-sufficiency pioneers such as Helen and Scott Bearing and Wendell Berry. By the time Foglia reached adolescence, the woods and fields around the farm had become suburbanised, but his parents continued to grow and preserve their own food, and to barter with other self-sufficient families throughout the area.